They are delightful littlebundles of joy that I love nibbling on whilst reading the news and sipping espresso. How lovely daaaaaahling. So, I went off on my merry way to find out how to make them and decided that food that temperamental and long-winded isbest left to the patisserie. 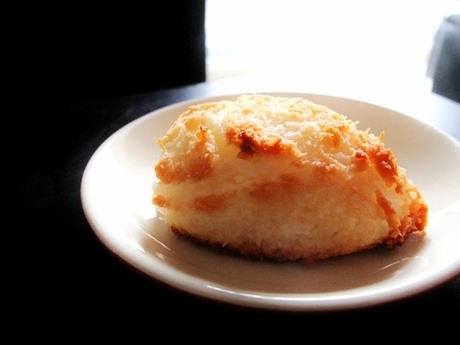 Then I settled for an old favourite – coconut macaroons. Preheat the oven to 180˚C. Add coconut, orange blossom water, sugar and 3 egg whites to a mixing bowl and beat with an electric mixer until combined. Add in remaining egg whites and stir with a spoon until it becomes sticky and combined. Line atray with baking paper and lightly grease (I used coconut oil) before spooning large tablespoonfuls onto the tray. You might like to shape them – I made minein to fat caterpillars! You don’t need to leave a lot of room between them asthey don’t spread, so load up the tray with your whole batch. Bake until they turn golden brown on top, about 10-15 minutes. Remove from tray with a metal spatula and cool on a wire rack. Try to stop yourself while eating them while still hot – burny! This entry was posted on 06/02/2012 by glutenfreeuae in Baking, Recipes and tagged coconut, gluten free, glutenfree, macaroons, YUM.